Peer-to-peer lending has been around here in the United States for the better half of a decade. This type of lending environment strives to bring both individual and institutional investors together with various grades of qualifying borrowers. The two main companies in the peer-to-peer lending arena are Lending Club and Prosper, with both having over five years of lending history. Since inception, these two loan facilitators have seen tremendous growth and change as they have developed and created an entire market for this type of lending. After opening my first Lending Club account in 2009, I have enjoyed great returns over the four years since. Currently, I am tracking two different Lending Club accounts, a taxable and a Roth IRA account. My taxable account was the account opened in 2009, and has a strong history of greater than 10% real returns over the four years I’ve been investing. My second account, the Roth IRA, was opened in November 2012 when I rolled over $10,000 from another retirement account. Since opening this account, I have slowly been investing the available cash in the account. If you’re interested in the taxation of Lending Club, check out the Lending Club Tax Guide. Below is the most recent summary of my two Lending Club accounts. I plan on opening additional peer-to-peer lending accounts over the course of the next couple years with both Lending Club and Prosper. As you can see, I am having tremendous success with these two accounts. 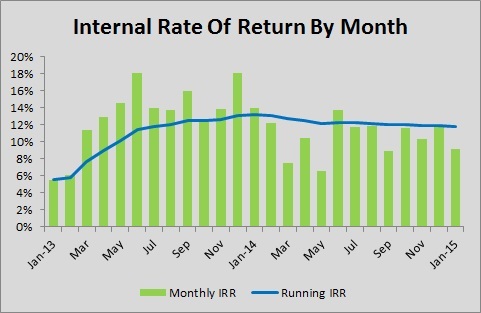 You will notice a significant difference between my XIRR return (an Excel formula calculating the internal rate of return)and the Lending Club’s Net Annualized Return (NAR). The NAR calculation utilized by Lending Club does not include any idle money in their figure. Additionally, I do not included accrued interest in any of my return calculations. As the time progresses, you will see my Roth IRA account’s XIRR return increase as the account ages, offsetting the idle cash during the initial investment period. I would anticipate by the end of 2013 for this number to begin to normalize to what my long-term return will be in this particular account. Included in the chart above is the period net interest, in this case the monthly amount, followed by the amount received over the previous 12 months, or trailing 12-months (TTM). While insignificant now, as this account ages, one will be able to see how trailing interest figure grows, demonstrating an ability for this account to compound and one day produce income to supplement my retirement without touching the principal. Net interest is calculated by taking the interest earned less any charge-offs, defaults, and service fees in the given period. If you are curious as to how I am selecting the loans in order obtain such results, please review my 2013 investment criteria and now also my 2014 investment criteria. I developed and fine-tuned these particular filters after many hours of backtesting with Lendstats and Nickel Steamroller. For some simple filters that will allow you to invest easily during times with few notes, check out my Simple Filters for Lending Club and Prosper post. 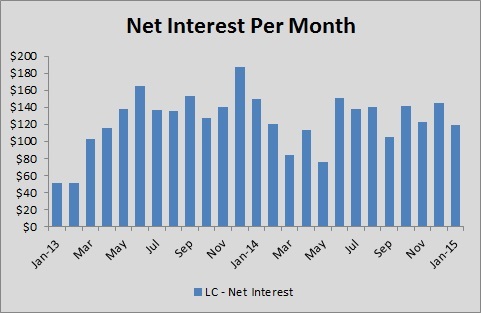 Additionally, the below chart tracks my net interest per month. Pretty sweet to see that amount growing over time! For me, Lending Club has been a tremendously rewarding asset class. I look forward to making significant contributions and gains from my various peer-to-peer lending accounts, as well as tracking my investments for years to come. Feel free to contact me if you have any questions about peer-to-peer lending or Lending Club specifically! I’ve been an LC fan since 2009. A great alternative for folks seeking unsecured loans and good returns on investments. Thanks for stopping by Jason. I agree with you that Lending Club is a fabulous investment and has the potential to truly house some significant returns for investors. I am looking forward to all of the developments with Lending Club, and peer-to-peer lending as a whole, over the next couple of years. I’m enjoying your Lending Club analyses. I opened an account months ago but never funded it feeling I didn’t have the time to properly come up with a strategy. New Years resolution: begin investing in LC.. Thanks for sharing your progress. Thanks Kay! I am quite happy to share my experiences as I am bullish on P2P lending as a whole, and think it is a great space for investing. Best of luck with your account in 2014! I am bullish as well. I just hope that as this platorm matures, they dont sell out to big money as so many other opportunities have. When we start to see special opportinities only for “accedited investors”, we should worry. Lending Club has been relying on institutional investor dollars for a couple of years now, and that won’t be changing for the duration of their existence. The accredited investor opportunities already exist and will absolutely be around for a long time. Fortunately, retail investors can still get their money invested however automation is absolutely the direction everything is headed. As an experiment, I have started using their PRIME service for my auto investing. I have a very tight filter and only buy C – F notes at this time. I am buying both 36 and 60 month notes. So far, so good. I have been very pleased with the quality of notes that PRIME buys. My plan is to build my PRIME portfolio to at least 50 notes so I can see over time how well this will perform for me. I was using BlueVestment prior to this little test, and I have always been pleased with Nathan’s service. Ray, I’m glad you are testing out the PRIME service and hope you have success with it. Please let me know how your experience with it turns out! You must do this to keep your risk of loss down in case of defaults. They will happen. Thanks for the comment Aiki Trader. I have only ever invested in $25 increments and will likely continue in the path for the duration of my investment. Combined, my P2P lending accounts have well over 1,000 notes and monthly swings due to defaults are a normal part of the portfolio aging process. How are you investing, with how much, and what level of success are you experiencing? I didn’t know you could have a LC account via a Roth IRA…that makes things VERY interesting. Interesting indeed! You can indeed open a Roth IRA account with Lending Club. You need $5,000 to open the account, and a $10,000 balance within a year to avoid any fees. I’ve had a ton of success in the nearly two years since I opened my Roth IRA with Lending Club. I am looking forward to letting the account continue to grow passively for the next 30 years.